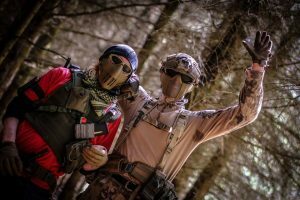 What better a way to celebrate your friends birthday than at Scotland’s premier Airsoft skirmish site. Catering for ages 11 years old and upward you can literally hunt down your friends in the country side. Stalk them through over 70 acres of woodland and check out our Land Rovers and Armoured Personnel Carriers. If you love playing war-games then this is the game for you. It is the real life COD and MW all rolled into one fast paced game. Faster than paintball and much cooler than laser tag Airsoft offers the best all round experience. Located south of Edinburgh it is easily accessible from either Edinburgh or Glasgow and we’ve created you’re very own warzone in which you and your friends can dig in and open fire with fully automatic fire! This’ll be great for those looking for a budget option – paintball may seem cheap, but the extra ammo is more expensive when compared to airsoft. Unless you’re a spray’n’pray kinda guy, 3,000 BBs will last you a good amount of the day. Another 3,000 pellets can be purchased on site for just £7. Lock’n’load, maggots! You’ll play a variety of team-based objective games, designed to challenge your inner tactician, beginning with a warm-up, simple game of capturing an enemy fort. Later in the day, there will be tank objectives, sabotage missions, capture the flag games and headquarters-type scenarios. The marshals will arrange the day’s games as they see fit for your skill level. Please bring a hat, gloves and decent footwear that you don’t mind getting dirty. - Any breakages resulting from misuse must be paid for. 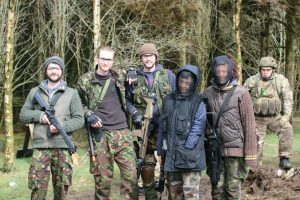 To discuss and arrange your airsoft birthday party experience, contact the team at Airsoft Edinburgh today. £20 per head non returnable deposit required 14 days before the event. £60 Per head, event organiser goes free. £30 per head non returnable deposit required 14 days before the event.